UPDATE 30 Jan: Guess who forgot to change the GUID in the wheelbarrow sculpture? I am officially very, very embarrased. And shame on the 3,800+ of you who didn't even notice! So if you're missing your apple-on-a-podium statue, you had better redownload it now. This is a set that I have been working on, on and off (more off than on I'm afraid) for the past couple of months. It does contain hacked code. In some objects the modifications are minor. In other objects the changes are quite extensive. Warning: Some of these objects can still be considered in beta. They have all gone through closed beta tests, but there may yet be undiscovered bugs. If you should find something you consider to be a bug, please let me know asap so that I can fix it. These plants periodically grow fruits which can be harvested by a sim. 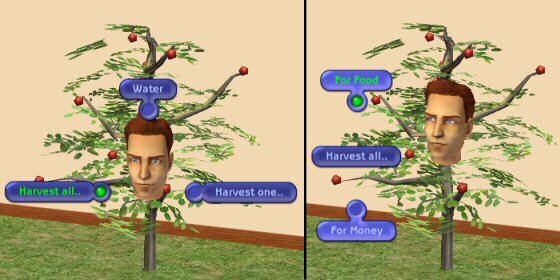 The sim may choose to harvest just one plant, or to harvest all of a particular type of plant in sequence. For example, by selecting "Harvest All" on an apple tree, all apple trees will be harvested. 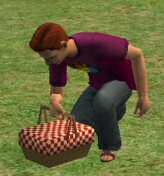 When a sim begins to harvest fruit from the plant, a harvest basket is created which keeps track of how much fruit has been picked. 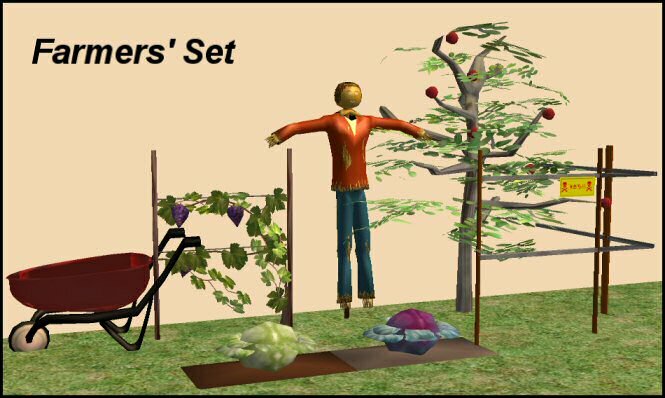 Once harvesting has been completed, the fruit in the basket may either be sold for simoleans, or used to restock the sim's fridge. The crops require periodic watering. If they are not kept watered they will lose their fruit and their leaves will turn brown. Eventually the leaves will fall off, and some time after this the plant will die completely. This behaviour is common to all of the crops, however they each have different regrowth times, different food values, and different fruit sale values. The harvest basket object is required for the crops to function correctly. In order to use any of these crops, you must first download the harvest basket. 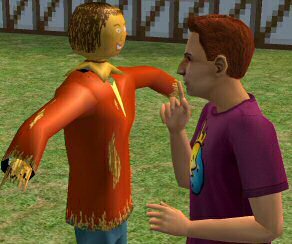 As well as being good to kick for stress relief, this scarecrow is also able to boost a sim's social points. 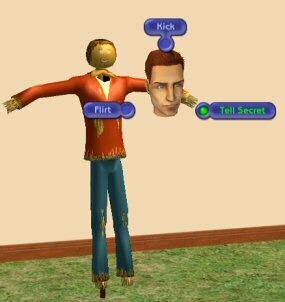 The "Tell a Secret" option and the "Flirt" option both increase social. Flirt increases it more dramatically, but it is only available when the social motive drops below the half way mark. In order to easily add pie menu controls, these fence pieces are buy mode objects, not proper fence pieces. It will, however, completely block a sim from passing through it. The electric fence comes across three files, which are described below. 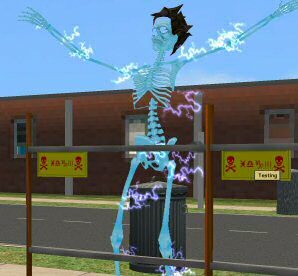 When touched by a sim, said sim will experience a (not so) mild electric shock. One of the more swift ways of removing an unwanted sim. Required for a straight section of fencing. Required to turn a corner in the fence. This one's purely decorative, but it fits with the theme so I'm including it. The scarecrow, wheelbarrow and electric fence warning sign are all recolourable. You are welcome to recolour these and distribute your recolours in any way that you wish. Unfortunately, due to the way that the textures are switched around in the crops, they are not currently recolourable. The harvest basket cannot be selected in buy mode, so recolouring it would be pointless. As with all my objects, I'm very liberal in letting people remesh these objects, or borrow my code for their own derivative objects. In the case of the harvestable crops, remeshing according to most tutorials will not work completely. If you wish to create more harvestable crops (please do, my farmer sims would love you), then PM me or post here and I will gladly step you through the process of creating new crops. (It's not much harder than normal remeshing, just a couple of extra steps). If it makes sense to use these objects in a lot (ie - you're sharing a farm or a house with developed garden,) then you may include these objects in a distributed lot with credit. However, I would prefer that lots created with the express purpose of mass distributing downloaded objects not include these. The former celebrates a creator's work, while the latter celebrates the redistributor. If you're not sure which category your lot falls into, then ask me directly - I'll most likely give permission . You can recolour and share to your heart's desire. That includes pay sites if you so choose (but I'm a strong supporter of free sites). Credit is appreciated, and links to my site make me happy. I also love to see what people make, so feel free to message me if you create something. - Quaxi, for the SimPE software. Without that, I'd be staring bemused at byte code. - Numenor, RGiles and Quaxi, for the CEP. Objects that are recolourable owe this ability to the CEP. - Peter Jones for the Simantics plugin. The ability to get immediate feedback on the changes being made to the BHAV code made this project practicable. - Sherri, Natasha, Andrea, Anthony, and Jerri, the wonderful players who volunteered to beta test these objects in their games and provided valuable bug reports and suggestions. Other notes: The scarecrow body mesh is heavily based on an in-game body mesh made by Maxis. The trunk of the apple tree is based on the trunk of the money tree. The grape vine leaves was based on two images copied from a Google Images search. The rest of the meshes and textures are (unfortunately) entirely my own work .